Thanks to all our fantastic cleanup volunteers! North of San Francisco Bay, wildfires have raged across the region for more than a week. Everyone at Baykeeper sends our heartfelt sympathy to those impacted by this tragic disaster. We hope for a full and safe recovery as work continues to contain the fires and as local responders begin to assess the damage and plan for rebuilding. Once the fires are out and North Bay communities are safe, Baykeeper's focus will turn to monitoring pollution impacts to the Napa River, Sonoma Creek, Carneros Creek, and parts of the Petaluma River, which all flow into northern San Francisco Bay. While rain will bring relief to the charred region, seasonal storms could also deliver a toxic pulse of runoff to local waterways. Toxic ash from burned debris and fire-fighting material can contain harsh solvents and harmful metals like lead, copper, and chromium that pose a threat to fish, wildlife, and people. Sediment erosion into the rivers and creeks may also increase with fewer trees and plants to hold the soil in place. It's too soon to know what the long-term environmental impacts of the North Bay fires will be. When the time comes, Baykeeper will monitor the threats and advocate for measures to minimize the pollution risks to the Bay’s watershed. For now, we’re keeping our friends, families, and supporters in the region in our thoughts. Map courtesy of Christina Toms. 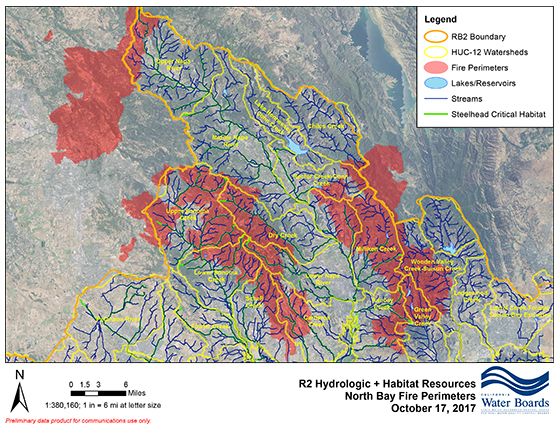 Red shaded areas show the fire perimeter on October 17; blue lines represent rivers and creeks throughout the North Bay. While the Bay Area has been hit by drastic wildfires, other parts of the US are recovering from dramatic flooding caused by hurricanes. These recent floods are a cautionary tale for the Bay Area, where sea level rise and storm surges can lead to toxic contamination across the region. The storm surge from the hurricane in Houston flowed over contaminated lands, including a Superfund site, spreading harmful pollutants such as dioxins, benzene, and PCBs into nearby communities. 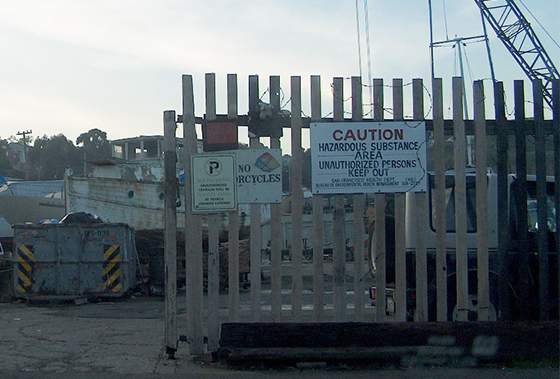 Here in the Bay Area, thousands of historically contaminated sites are located along the Bay. Rising sea levels and stronger storms will inundate these areas and could wash hazardous waste into the Bay and local creeks, where it can harm wildlife and people. Proactively addressing the serious issue of contaminated lands around the Bay is critical for preparing the Bay Area for climate change. Baykeeper recently worked with Google to map the San Francisco Bay shoreline for sea level rise planning, and we are now identifying vulnerable toxic hot spots to prioritize. Read more about legacy pollution hotspots along the Bay. Hunters Point, pictured above, is one of the many legacy contamination sites that ring the Bay and are vulnerable to flooding. Baykeeper has joined a court action challenging the proposed Delta Tunnels—a massive water project that will harm San Francisco Bay. Baykeeper has filed legal action against the California Department of Fish & Wildlife. Along with our partners at the Bay Institute, NRDC, the Center for Biological Diversity, and Earthjustice, we're challenging the Department's approval of a permit for the project. The permit contradicts extensive scientific evidence showing the Delta Tunnels will harm native fish and wildlife. The Bay-Delta estuary is already starved for freshwater, and the Delta Tunnels would divert more water away from the Delta and Bay to supply Southern California and the Central Valley. You can read Baykeeper's in-depth analysis of the risk posed by the Delta Tunnels project. "The Bay ecosystem needs freshwater from the Delta to survive and be healthy," said Erica Maharg, Baykeeper's Managing Attorney. "Instead of a short-sighted project that threatens San Francisco Bay, California needs to plan for long-term sustainability, with a focus on smart water use and conservation." We're also working to stop a new threat to the Bay's freshwater flows. The Trump administration recently approved a controversial plan to increase pumping from the Delta, which would harm salmon and other threatened native fish. Baykeeper and our partners are urging state regulators to oppose the plan and keep Bay tributaries healthy for fish. Read more about our lawsuit challenging the Delta Tunnels project. This coming rainy season, less industrial contamination will flow into San Francisco Bay from former polluters. 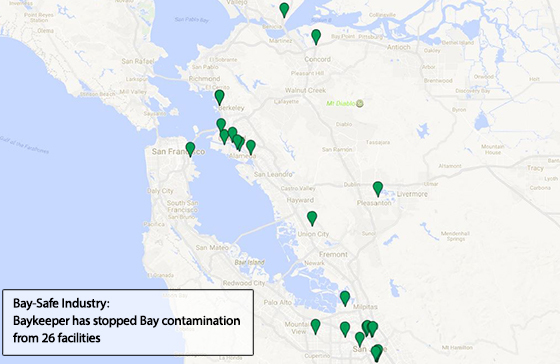 Thanks to Baykeeper's Bay-Safe Industry campaign, 26 industrial facilities that used to contaminate the Bay during wet weather have now cleaned up their toxic runoff. The 26 facilities are located in cities across the Bay Area, including San Jose, Santa Clara, Sunnyvale, Hayward, Oakland, Berkeley, Alameda, and Benicia. Each company signed a legally-binding agreement with Baykeeper requiring them to improve their operations to protect the Bay from pollution. Rain that falls on outdoor areas of industrial facilities can pick up dangerous levels of heavy metals, oil and grease, and other toxic substances. When the contamination washes into storm drains or creeks that flow to the Bay, it can harm wildlife and people who spend time on or near the water. Baykeeper launched the Bay-Safe Industry Campaign five years ago to reduce this prevalent source of pollution. 13 more industrial facilities are in the process of implementing pollution controls. If initial controls aren't effective enough, we will work with the companies to achieve required improvements. We'll continue our investigation and oversight to stop industrial contamination of the Bay. Read more about Baykeeper's success fighting industrial pollution. You can stop pollution in the Bay from microbeads—very small plastic particles found in some cosmetics and personal care products. They spread through aquatic ecosystems and hurt fish. 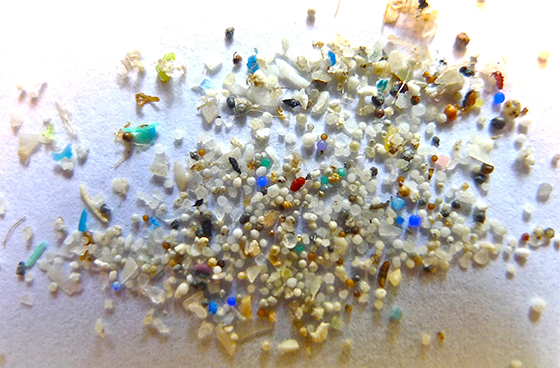 When rinsed down the drain, microbeads are too small to be removed by sewage treatment. Instead, they are released into the Bay, where they can absorb toxins that concentrate in fish and marine creatures that eat fish. Microbeads accumulate and can move up the food chain, resulting in eventual impact on larger wildlife and people. In 2015, Baykeeper worked with our partner groups to help win state legislation banning microbeads in consumer products. Many manufacturers have begun phasing microbeads out of their formulas, but the ban doesn't come into full effect until 2020. In the meantime, you can help stop microbead pollution in the Bay by checking the labels of your personal care products, particularly exfoliants and cleansers. Avoid products containing Polyethylene (PE), Polypropylene (PP), Polyethylene Terephthalate (PET), Polymethyl methacrylate (PMMA), and nylon. Microbeads are just one type of microplastic pollution; other small plastic particles come from trash fragments, synthetic clothing fibers, and manufacturing residue. Baykeeper is working in partnership with the San Francisco Estuary Institute to measure microplastic pollution in the Bay and to discover more about the sources of this pollution. Join Baykeeper at Outdoor SF on November 15! This annual event is a fun celebration of San Francisco's outdoor start-up companies and the importance of giving back to the environment we all love to enjoy. 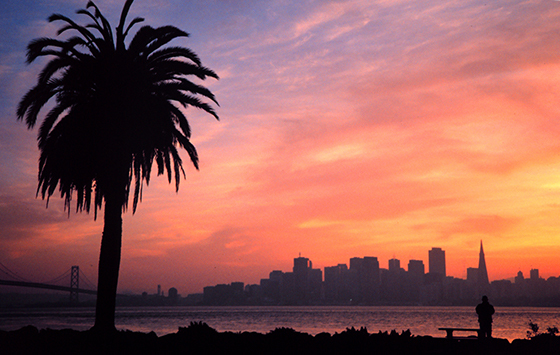 This year, Outdoor SF will benefit Baykeeper's work to keep San Francisco Bay thriving! Plus, champion long-distance swimmer and Baykeeper Leadership Circle member Kim Chambers will be there to talk about her love for swimming in San Francisco Bay. We'll be there on Wednesday, November 15, at Folsom Street Foundry, along with Sunski, Clif Bar, Oru Kayak, Rumpl, Peak Design, Topo Design, Huckberry, Kuju Coffee, and Mohinders. Enjoy live music and tasty local food. And you'll get to meet lots of other members of the outdoor community who believe in giving back to nature. Early bird tickets are $20 and on sale now. Visit the Outdoor SF website for more details and to purchase tickets. 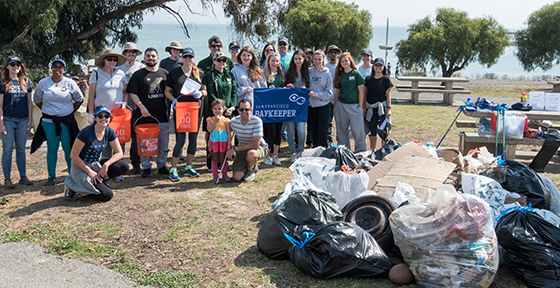 Over the past month, Baykeeper hosted three shoreline cleanups to prevent trash pollution in San Francisco Bay. We couldn't do it without our terrific trash-stopping volunteers! We removed hundreds of pounds of trash from India Basin Shoreline Park for Coastal Cleanup Day, from Aquatic Park with the Dolphin Swimming & Boating Club for Bay Day, and from the Marin Audubon Society's Tiscornia Marsh with Holy Hikes. On behalf of all the creatures who live in and along the Bay, thank you to our volunteers. San Francisco Bay is cleaner and healthier for your efforts! If you missed out—don't worry! Several more cleanups are coming up soon. Check for details on our events page and watch Baykeeper's Facebook page for more news. Looking for a way to contribute to the health of San Francisco Bay? Baykeeper needs volunteers who can help with sending mailings this season. If you're a stamping, glue-sticking, envelope-stuffing Bay supporter, this is the role for you. We're also seeking a Development & Communications Intern to assist with event logistics, mailings, outreach, database support, and other administrative duties. This is a part-time volunteer position, with a minimum commitment of one day a week over the fall/winter season. Interning with Baykeeper is a terrific opportunity to develop skills in nonprofit fundraising, outreach, and event management. The Baykeeper office is conveniently located in downtown Oakland, one block from 19th Street BART. For more details, please email info@baykeeper.org expressing your interest in volunteering or interning with Baykeeper.